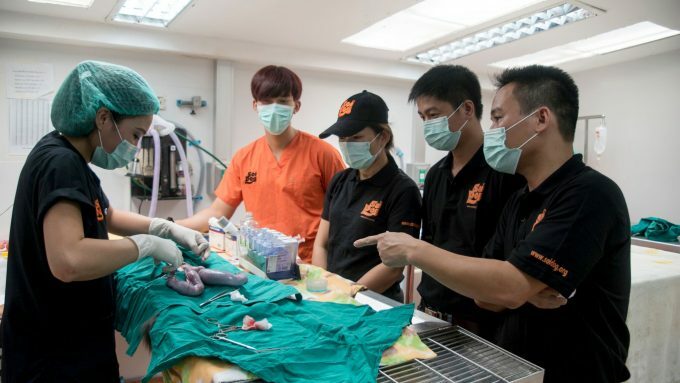 Four veterinarians from the Department of Animal Health in Vietnam participated in an intensive week-long shelter medicine externship in Thailand arranged by UF MSMP alumna Dr. Katherine Polak. In Vietnam, as many as 5 million dogs are killed for their meat. Most are snatched from their homes, crammed into cages, transported many hours in inhumane conditions, and beaten to death. Almost all animals destined for human consumption are transported along Highway 1, a route that runs the length of the country. Dogs and cats travel from southern to northern provinces where dog meat eating is most popular. The good news is that there are indications that the desire to eat dog meat in Vietnam is waning. However, the government is currently unable to stop trucks carrying large numbers of dogs and cats as there is no suitable space or shelter to house rescued animals, and Vietnamese veterinarians lack the skills to administer vaccines or humanely euthanize an animal, if necessary. 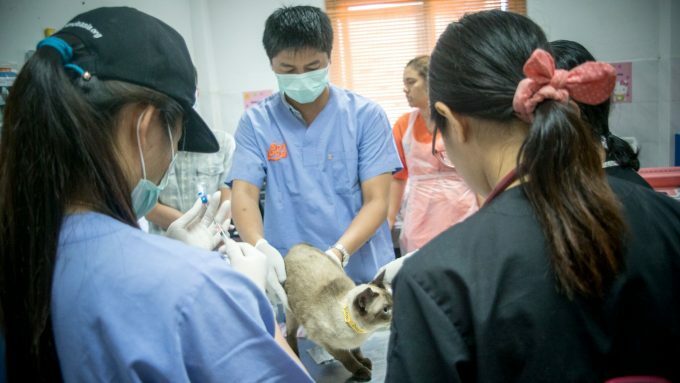 The veterinarians selected for the training work in Vinh City, a small town in North Central Vietnam and the capital of Nghệ An Province. Animal health officials in Vinh City appear receptive to stopping dog meat trucks along Highway 1, which passes through Vinh City. The purpose of the week-long visit was to provide the veterinarians with training in the basics of animal handling, vaccination, and sheltering. 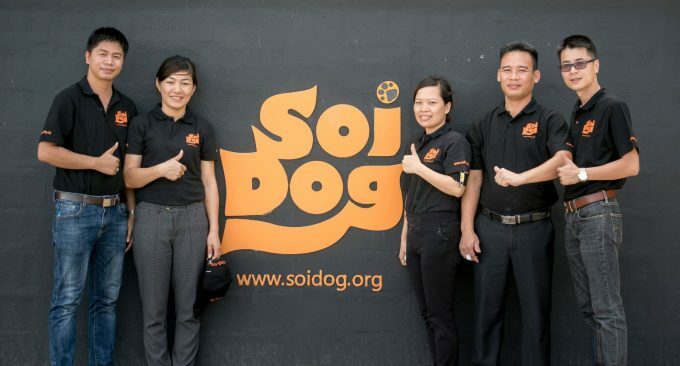 During the intensive 7-day training, the trainees rotated through various areas of the Soi Dog Foundation shelter including the dog hospital, enclosures housing dog meat trade survivors, the cat hospital, and spay/neuter clinic. They learned how to perform physical examinations, recognize signs of illness, house and handle animals humanely, and administer IV injections. 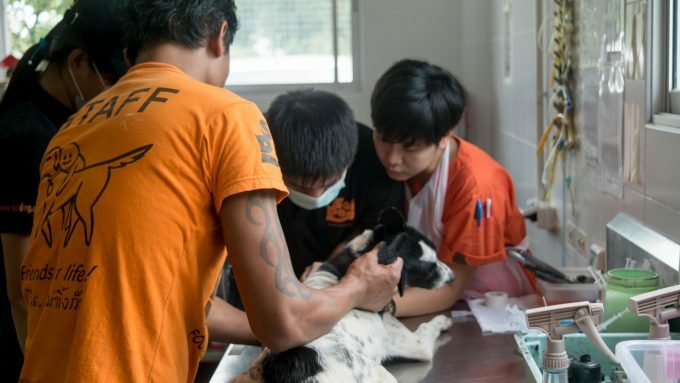 The training was an initiative of the Asia Canine Protection Alliance (ACPA), which consists of Change for Animals Foundation, Animals Asia, Humane Society International, Four Paws, and Soi Dog Foundation. For more information on ACPA, please visit: http://www.acpagroup.org.